For those who have never visited this resort, the Venetian is a re-creation of (duh) Venice, right in the middle of Las Vegas. Frescos, paintings and sculptures abound: on the roof, on the walls, and around you. The all-suite hotel boasts of rooms that have sunken living areas, gold and marble bathrooms and three flat screen TVs. The Canyon Ranch Spa in the hotel occupies almost 100,000 sq.ft of space and provides a wide-variety of options to choose from. This resort has a multitude of upscale restaurants run by celebrity chefs that include Wolfgang Puck, Mario Batalli, Emeril Lagasse and Thomas Keller. And the Grand Canal Shoppes re-creates the magic of Venice with its cobbled streets gondolas, shops and bistros, all under an artifical evening sky! I had a couple of lunch meetings at the 'outdoor' restaurants in the Grand Canal Shoppes area. Due to the artificial sky, it always seems like evening here, which also means 'outdoor' is actually indoors! Also, with European street performers singing and performing at the St. Marks Square, this place is quite lively and a good place to relax after some hectic meetings. On one day, I ate at the Canaletto which serves authentic Venetian cuisine, and on another I tried Mario Batali's Enoteco San Marco. On both days I opted for pizzas. The Pizza Con Salsiccia at the Canaletta was a thin-crust pizza with spicy sausage, mixed bell peppers and carmalized onions with tomato sauce was delightfully crunchy. The Peppers & Sausage pizza at San Marco had Italian sausages, roasted peppers and mozarella. I thoroughly enjoyed both of them! This time, I haven't even ventured out of the Venetian - yet. 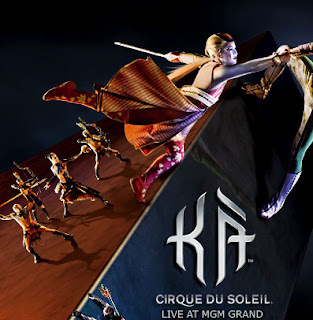 I also don't have time to watch a show; during my last visit I had watched KA by Cirque du Soleil at the MGM Grand and was completely bowled over. Extremely exotic, the characters, costuming, lighting, music, special effects and superb athletic and acrobatic artistry combine to give you so many memorable, visually spectacular jaw-dropping experiences that the intricately involved story will prove relatively insignificant compared to what dazzles your eyes and boggles your mind. It is useless to say that you have to see it to believe it because you still won't believe what you're seeing. However, Cirque du Soleil maybe going down the same path as Starbucks - too much expansion, too fast. When I first came to Vegas in the early 90s, there was only Mystere at the Treasure Island, their only show in the US. Now there are half-a-dozen of their shows here and more in Orlando and elsewhere in the US - with Beatles LOVE being their latest show at the Mirage. Breath taking - looks so pitoresc - almost like a fairytale - thanks for sharing - the movee was just marvellous as it was so well conducted! @sandeepa: You must! There's nothing quite like it. High-quality circus, theater, and acrobatics combined into spectacular shows. @rennyba: Thank you. I am sure the real Venice must be even better! hey ... have u been to vietnam yet? I am thinking of going in august... have u posted anything on it??? this looks fairly easy to make. what a lovely way to have prawns and a easy recipe too. i missed the cirque in vegas but saw the blue man show. its amazing. @holly jean: Thank you! Yes, I did visit Vietnam, but only briefly and therefore did not do much, outside of a river cruise on the River Saigon. Check my posts from Nov 2006. @inder: Thank you! Yeah, Cirque du Soliel has 'roaming' shows too. However, KA and O at Vegas have incredible stages that probably cannot be replicated elsewhere. Re: Emeril, I actually did. Delmonico, which I posted earlier, is Emeril's steakhouse. He now has another new one at the Palazzo called Table 10.